BRITISH POLICE ARE investigating a claim of sexual assault against Oscar-winning actor Kevin Spacey, The Sun has reported. Scotland Yard said it was looking into a complaint made over an incident in south London in 2008, but the Met Police told TheJournal.ie that it does not identify any person subject to an investigation unless they have been charged. “On 1 November, City of London police referred an allegation of sexual assault to the Metropolitan police service,” a Scotland Yard spokesman told UK media outlets. 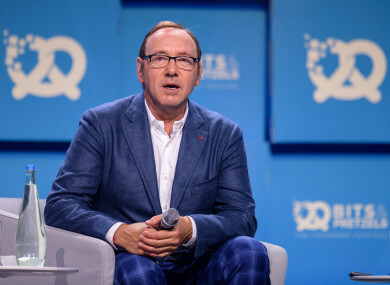 The incident occurred near The Old Vic theatre, where Spacey was artistic director from 2004 to 2015, according to The Sun. Meanwhile, former workers at The Old Vic told The Guardian newspaper that the London theatre ignored allegations of groping and inappropriate sexual behaviour. The two-time Oscar winner “was taking advantage of the fact that he is this great icon. He touched men on the crotch. Doing it really fast so they couldn’t get out of the way. The thing that really upsets me is the hypocrisy of places like The Old Vic that pretend now that they didn’t know. Elsewhere, Spacey has been dropped by a Hollywood talent agency as well as his publicist in the wake of sexual assault allegations made against him. CAA, which has represented the actor for over a decade, as well as publicist Staci Wolfe are now distancing himself from the House of Cards star who has been accused of sexually assaulting a 14-year-old boy in the 80s. CNN is reporting that eight current or former House of Cards workers claim that Kevin Spacey made the production a “toxic” workplace and one ex-employee alleges the actor sexually assaulted him. The workers’ identities were withheld from because they fear professional fallout. Among them is a former production assistant who alleged that Spacey assaulted him during one of the Netflix show’s early seasons. The report accuses Spacey of allegedly targeted staffers who were typically young and male with nonconsensual touching and crude comments. Netflix and Spacey’s publicist didn’t immediately respond to requests for comment. The fallout stems from last weekend’s BuzzFeed News report in which actor Anthony Rapp said that Spacey attempted to seduce him in 1986, when Rapp was 14. Spacey apologised earlier this week for the incident but said he didn’t recall what might have been “drunken behaviour”. In a statement Wednesday, Spacey’s publicist said he’s seeking unspecified treatment. With reporting by Associated Press and Hayley Halpin. Email “UK police are investigating sexual assault claims against Kevin Spacey”. Feedback on “UK police are investigating sexual assault claims against Kevin Spacey”.